​A deposit of $100 is required to hold any doe or wether. We require a deposit of $200 for bucks or bucklings. Reservations may be placed without deposit for doelings, bucklings, or wethers from bred does. We reserve the right of first choice to retain any offspring. Once kids are on the ground, a deposit is due within 7 days or your selection is forfeited. Once received, deposits are refundable ONLY if an animal becomes sick or injured while still in our care, if we choose to retain an animal, or if we cannot otherwise fulfill your request. Should the buyer have a change of mind or decide not to complete the sale for any reason, the deposit is forfeited. We dam-raise our kids, as we believe this practice to be the healthiest for their growth and development. However, by maintaining a small herd, we are able to lavish attention on all our goats, which makes them very people-friendly in nature. In the unusual event of a dam’s rejection of a kid, we will bottle feed it. Generally, however, we personally find “bottle babies” to be a bit neurotic. All animals sold will be disbudded, tattooed, dewormed, and have registration applications or papers when they leave our property. We maintain a closed herd and test annually for CAE, Johnnes, and CL. All animals leaving our herd are healthy and sound at the time of departure. However, once an animal leaves our possession, we cannot warrant its health, as we have no control over its care or exposure to environmental factors beyond our supervision. We are under no obligation to take back any animal once it leaves our possession. Additionally, we cannot take responsibility for illness, accidents, damage, or death that might result during shipping, as these, too, are events beyond our reasonable control. Health certificates and vet checks, if required, as well as shipping fees, if any, are the responsibility of the buyer. Many factors contribute to the growth and development of an animal: proper nourishment, health maintenance, parasite control, housing, and stress. Though we strive to breed for both strong conformation to breed standards and high milk production, we cannot warrant an animal’s ultimate maturity or performance. On occasion, we may ask to retain breeding rights to a buck or buckling sold from our herd. This matter will, of course, be discussed with prospective buyers in advance of sale. We do not do “doe kid back” sales nor do we offer herdsire service. All kids MUST be picked up by 8 weeks of age. Beyond that, boarding fees apply at the rate of $8 per day per animal. Additionally, arrangements for boarding MUST be made and paid for in advance. 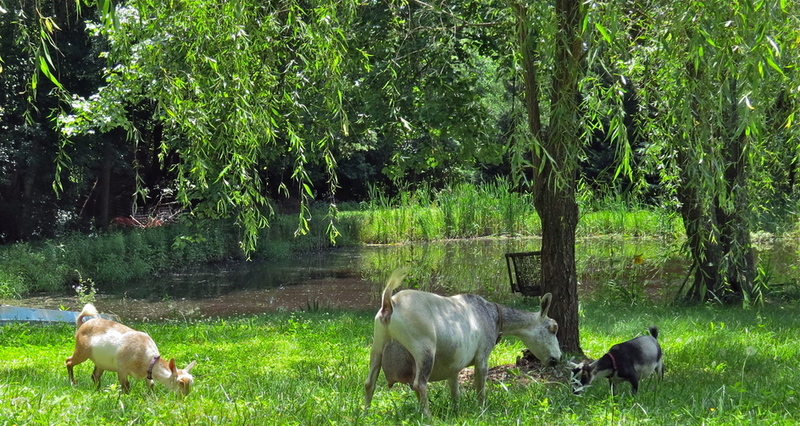 Balances due must be paid in full before a goat leaves our property. Final payments done at the time of pick up must be made in cash. We will accept installments paid by check; however, checks must have time to clear the bank before any goat may leave our property. Finally, we appreciate your business and will be happy to assist you through an animal’s transition to your home or herd by answering any questions in good faith and to the best of our ability. The success of your herd is a reflection of our own. As our many repeat buyers will attest, we are here to help.